Two bathrooms en-suite. The other is a downstairs shower room with a bedroom opposite. 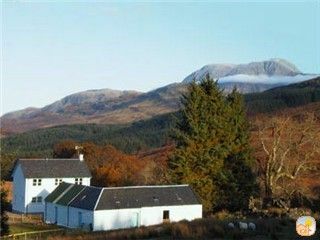 Although quite remote, these two farmhouses are only three miles from Fort William which makes self-catering easy with a large Safeway's separated from the town with it's own car park. There are many shops and restaurants in the town as well as a cinema, museum, tourist information centre, heated indoor swimming pool, leisure complex with snooker, a bowling alley, fitness centre and small children's play area. There is a wonderful scenic steam train, which travels from Fort William to Mallaig. For those wanting to enjoy the great outdoors there are two golf courses locally, skiing (with a cable car open in the summer for spectacular hill walking) pony trekking, fishing, climbing and water sports as well as a chance to see many species of birds and wildlife. This area of Lochaber boasts itself to be one of the few areas of Great Britain still to have otters, red squirrels, pine marten, golden eagles and the occasional wild cat.